Task One - Impact on Information Availability What electronic information do I access and what impact has this had on my life The internet has had a huge impact on people's lives throughout the world, it allows people from all over the world to communicate and meet in one place, and the impact is clearly visible in today's society. Originally used for communication and business the internet has quickly grown and everything can now be found on the internet quickly and easily. Personally, the internet plays a big part in my life as it is easy to find any information that I may require. It assists me in my school work and revision with sites like BBC Bitesize set up with revision resources and links to other helpful sites. I also use the internet for the latest news (and weather) using sites such as BBC News which contain all the days main headlines as well as discussion by the public on these stories. More recently I have been using the internet for online shopping, which is particularly helpful for events such as Christmas, with sites like Amazon and Play supplying goods for cheaper prices than most high street retailers as well as quick and efficient delivery. ...read more. The old The internet has been a great tool and has had a huge impact on the lives of many older people in society. The vast choice of social networking sites helps them to get in touch with people they may have other wise have lost all contact with, through sites such Friendsreunited. There is also a variety of game sites aimed at the older generation, and one of these biggest growing games on the internet is Bingo, where users are able to win real money. The internet has not only helped older people on a social level it has also been used to educate them allowing them training to gain skills of how to use computers, the internet has also aided older people, (mainly OAPS) through finance sites to check their pension and pension details through sites such as the official DWP website. The young Most young people have grown up with access to the electronic information and as a result don't really see what sort of impact it has on their day to day life, but if this information was not available to them, their lives would be very different. 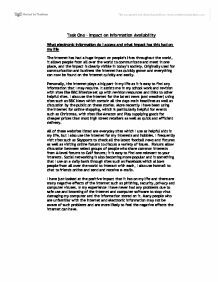 Revision sites such as BBC Bitesize have become crucial to students sitting exams with all relevant information in one space, the internet has also ...read more. the internet and other electronic information play a huge role in businesses and many people's lives on a daily basis, the main areas in society without access to the information are over 55's, those with little or no computer experience, those on a low income and disabled people. People without this information may find it hard to communicate with people and may be disadvantaged in terms of education, work etc. People without this information are less likely to be employed as a basic knowledge of it is generally needed in almost all well-paid jobs in society, this is especially relevant to say an over 55 that may not have the skills to use a computer or search the internet or because they can simply not afford to purchase equipment such as a PC/laptop. 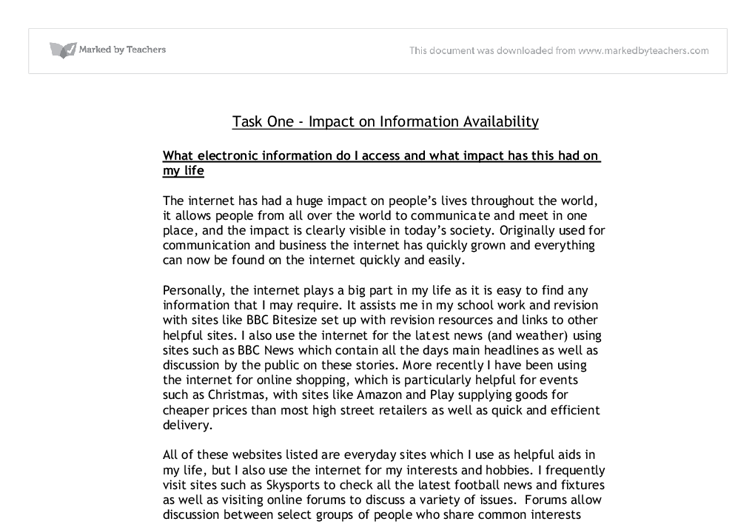 The large majority of people in the UK have some form of access to this electronic information but in less developed countries, this information is scarce and many people will never experience the use of it meaning they may struggle during their school life and when they are later looking for work. Disabled people are another group in society that may be without such information, such people may wish to access this information but may struggle due to severe disabilities such as blindness. ...read more. The report states how the use of information has helped a number of different people within sociality, ranging from family life to business. This is quite good, however the section 'Business' is lacking detail and this in my view should be the largest of all these sections. As business use information on-line as apart of their daily operation's. The report gives a number of real examples, where the student states which websites he/she visits and how the information is useful to the student. The examples are in-depth and acknowledges that the available of this information is positive. In addition, the student describes a number of drawbacks which the report states needs to be taken into consideration when accessing information. This is a balanced report, which states the positives and negatives, alongside the overall conclusion. The last paragraph of the report, is lacking one key term which should have been used. The term 'Digital Divide' should have been used, as this describes how some people cannot access the internet. On the plus side, the user does describe the term 'Digital Divide', without stating the term. It might be the case, that the student isn't aware of this term but is aware of the effects of the term. For example, onion skinning allowed me to see the previous and next frame so that I could see the overall movement. Looping was used to make the animation repeat itself and run again. This was useful if I did not want the animation to stop after running once. This may be needed, but it may not so adjust to your needs. On the next screen prompt, you will be asked if you want to download and install the latest Windows Vista updates. You should normally select yes. If there is no internet connection select no. at the age 19. After leaving south Devon college she began her first job of being a waitress in one of the nearby restaurants, as she did not have enough money to go to university, this job helped her gain the confidence to talk to people and help her interact with people she doesn't know. Poverty is not only found in developing countries and continents but it is also a common reality within the UK, where certain individuals cannot afford to buy computers and have internet access at home as their concerns are similar to those in developing communities.